We’d love your help. Let us know what’s wrong with this preview of Biblical Eldership by Alexander Strauch. To ask other readers questions about Biblical Eldership, please sign up. In my years of being a pastor's kid, then a worship leader, and now training for pastoral ministry myself, I've only grown in my conviction that biblical church leadership is of utmost importance. Much of the spiritual deadness we see in the modern evangelical church is directly attributable to unbiblical leadership structures, or disqualified men in leadership, or both! Strauch's Biblical Eldership is really a modern masterpiece of addressing what the Bible teaches on how God desires His church In my years of being a pastor's kid, then a worship leader, and now training for pastoral ministry myself, I've only grown in my conviction that biblical church leadership is of utmost importance. Much of the spiritual deadness we see in the modern evangelical church is directly attributable to unbiblical leadership structures, or disqualified men in leadership, or both! Strauch's Biblical Eldership is really a modern masterpiece of addressing what the Bible teaches on how God desires His church to be ordered. Most striking to me was how much "air-time" the New Testament gives to directions to and for the elders of the early church. When people complain of bad experiences with a church, or a pastor, or board of elders, I have found that the problem wasn't a "too faithful" to Scripture, but a "not faithful enough". Strauch masterfully demonstrates that the Biblical model for the ordering of the Church is found in a plurality of biblically qualified pastoring elders (that are men)! He pithily remarks, "A biblical eldership is not a church board that conducts business for two or three hours a month— it is a hard-working, pastoral body." All too often the church is run like a business, rather than like what it is in truth: the house of God, which is to be pastored, shepherded and led with all humility. Strauch again: "Christ’s presence is with the whole congregation, not just the elders." He goes on to show how the New Testament is full of admonitions, warnings, threatenings, cautions, and directions for the elders who rule the Church of God. When there is an abusive, unhealthy church, it is always the result of neglect of the biblical qualifications of the individual elders, or else an unbiblical ordering of leadership (i.e. a sort of "board of directors" with the Senior Pastor as CEO). A "top-down" model only leads to a corruption of the alpha male; in contrast, where Scripture doesn't necessarily give the "method" for how the preparation, selection, and appointment process works, it clearly lays out the principles that must guide the church. Further, the Scriptures do provide us with a healthy understanding of how a plurality of male elders, whose goals are the goals of shepherding and caring for the people of God (and viewing themselves as included in that body). This plurality of elders ensures that the men on the session or group of elders are responsible to keep each other accountable to the biblical standards of behavior and lifestyle both in their personal and private lives. 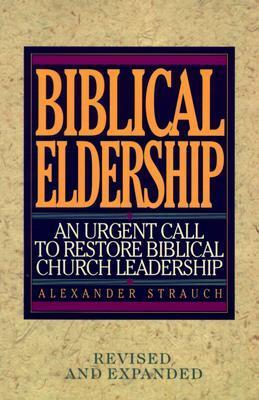 Strauch shows without a doubt how a Biblically based Christian eldership should function, justifying the books subtitle "An Urgent Call To Restore Biblical Church Leadership", in an age where it seems that anything "new" or "edgy" is best, Strauch draws us back to the Bible and shows why we need to restore the Biblical model. Issues like gender, plurality of elders, the necessity of elders, qualifications of elders, roles and responsibilities of elders, disciplining an elder, appointing elders are covered very well. There are 155 pages that are devoted to the exposition of scripture in relation to elders and the office of elder and exegesis of various passages, such as I Timothy 3, 5 and Titus 1 on the office of elder. I also appreciated his sections on Acts 15, James 5:13-18 and Hebrews 13:17. I would recommend it to anyone interested in being an elder, or for any Church that is interested in doing a "check-up" on their current practices in this area. An excellent basic overview of the officer of elder. The strength of the book is the exegesis of various passages, such as I Timothy 3, 5 and Titus 1 on the office of elder. I also appreciated his sections on Acts 15, James 5:13-18 and Hebrews 13:17. I did not necessarily agree with all his conclusions, but his work on these passages provided a lot of food for thought. I would recommend it to anyone interested in being an elder. I had two questions that he did not answer well. First, how much of An excellent basic overview of the officer of elder. The strength of the book is the exegesis of various passages, such as I Timothy 3, 5 and Titus 1 on the office of elder. I also appreciated his sections on Acts 15, James 5:13-18 and Hebrews 13:17. I did not necessarily agree with all his conclusions, but his work on these passages provided a lot of food for thought. I would recommend it to anyone interested in being an elder. I had two questions that he did not answer well. First, how much of Paul's ministry is paradigmatic for the elder? For example, I and II Corinthians contain several passages describing Paul's ministry. Do these passages have anything to say to the elder? Strauch did not answer this question very clearly. The reason I bring it up is because if Paul's ministry is a paradigm for an elder then it would seem to imply two types of elders or two offices (minister of the Word and ruling elder). Normally, a ruling elder who works a job 40-50 hours a week cannot be doing what Paul did. Second, how much of Paul's instructions to Timothy and Titus, outside of the passages specifically about elders, apply to elders? Here I am asking the same question as the one above. If Timothy and Titus are paradigms for elders then there would appear to be two offices or at least two very different duties within the same office. A man who works 40-50 hours and is a ruling elder on the side is going to have a difficult time using Timothy or Titus as a paradigm. Some of this is implied in I Timothy 5:17-18. Alexander Strauch has written a solid treatment of elders as they were meant to be by the Bible. At least half the book is exposition of Scripture texts related to elders - a real strength. You need a team of multiple elders who are humble servants who can teach and apply Scripture to the flock in a caring and truthful way. I can see this book being a God-send to Baptist or non-denominational congregations that begin to realize they should have elders and wonder where to start. It feels like the o Alexander Strauch has written a solid treatment of elders as they were meant to be by the Bible. It feels like the other half of the book is Strauch’s strident opposition to clericalism. He has a chip on his shoulder against educated pastors being distinct from elders. That can lead to professionalism and the pushing aside of elders doing their shepherding work, but the education is needed, and the distinction should be noted officially in the body (1 tim 5:17). His fixation with not having lone pastors could be very discouraging to pastors in small churches with little other leadership, or it could keep a formally educated elder from feeling he has something important to contribute to the elder team. Churches need to value both the shepherding of lay elders, and the training of a full-time elder/pastor, without devaluing one at the expense of the other. To put this in 2-office, 3-office (2.5-office!) terminology, Strauch is 2.1 office, while I am 2.75 office. Our church is in the process of transitioning to elders. Our pastor encouraged us to research for ourselves the biblical justification for eldership, which is what led me to this book. Strauch lays it out clearly that eldership is in fact biblical and provides scripture to support his claims. Very informative and biblically sound. Very good. Also read in April of 1991. One of the most biblically saturated studies on the office of Elder in the church. This is a must read for any church leader, possible elder, seminary student, pastor, etc. Anyone who desires to understand what Eldership/Pastoralship is should read this book. I'd encourage church members to read this as well to better understand the qualifications of those who lead them and to be able to hold them accountable, encourage them, and pray for them. As with most of Strauch's works, it focusses mostly One of the most biblically saturated studies on the office of Elder in the church. This is a must read for any church leader, possible elder, seminary student, pastor, etc. Anyone who desires to understand what Eldership/Pastoralship is should read this book. I'd encourage church members to read this as well to better understand the qualifications of those who lead them and to be able to hold them accountable, encourage them, and pray for them. As with most of Strauch's works, it focusses mostly on the texts that deal with the subject at hand. In almost expository manner, he works through many texts, draws on application to the role of elders, and charges the church to be biblical in her organizing of leadership. Read and keep as resource. This is an incredibly thorough and well organized look at the role of Elders in the church and the church leadership structure as organized by God in Scripture. Strauch does a wonderful job setting out the argument for a the church being led by a plurality of Elders who are both shepherds and overseers of the church. He also is careful to present elders as appointed leaders who are not ordained as a separate class of believers, but are leaders among the congregation. T Read and keep as resource. This is an incredibly thorough and well organized look at the role of Elders in the church and the church leadership structure as organized by God in Scripture. Strauch does a wonderful job setting out the argument for a the church being led by a plurality of Elders who are both shepherds and overseers of the church. He also is careful to present elders as appointed leaders who are not ordained as a separate class of believers, but are leaders among the congregation. The church is a collective priesthood, and elders are servant leaders with Christ alone as the head of the church. I had to read this book as a pre-eldership requirement. It was a thorough reading of every scripture verse(s) on elders (overseers, bishops, pastors). He clearly explains what the Bible says about qualifications and expectations of elders. This is not a practical book. It is not a book about how to be a better leader. This book is strictly exegesis on the scriptures related to Eldership. The author goes through the greek and hebrew, cultural context, and historical understanding. There is times I had to read this book as a pre-eldership requirement. It was a thorough reading of every scripture verse(s) on elders (overseers, bishops, pastors). He clearly explains what the Bible says about qualifications and expectations of elders. This is not a practical book. It is not a book about how to be a better leader. This book is strictly exegesis on the scriptures related to Eldership. The author goes through the greek and hebrew, cultural context, and historical understanding. There is times where sentence structure and tense of verbs are crucial to understanding the passage. I found this book extremely profitable to me as I just graduated from a reformed seminary. Strauch has helped me bring back the right and biblical perspective on Eldership. This is a clear outline of what it means to be a pastor/shepherd/elder in the church. While every desiring to be a pastor should read this book, church elders (plurality) must need to study this guide for themselves. I couldn't agree more of its propositions. I will mentor future leaders with this study. Biblical Eldership is a thorough exegete of the Biblical texts on Eldership. Today many elders function more like a board of directors leading a company than they do as those called to live like Jesus, teach sound doctrine, and refute false teaching. Any elder or aspiring elder who reads this book will walk away with a sharpened conscience and a clear understanding of their weighty responsibility as leaders in the Church. A very helpful and clear picture of what eldership looks like in the NT. I thought this book stands above the average book on eldership by being repetitive but not in a bad way. I like how he points out Acts 20, 1 Tim. 3,5, Titus 1, 1 Peter 5, Heb. 13, and James 5 all as key passages for eldership. A much needed overview of what the Nat elder should look like in the Church today. Exceptional book. Strauch unpacks Scripture regarding church leadership and lays out the biblical instruction concerning pastors (elders, overseers, shepherds, stewards, etc.). The ineffectiveness of the modern western church can in part be attributed to the lack of understanding of biblical eldership. A must-read for church leaders and congregation members. A helpful and thorough guide to restoring biblical leadership in the Church. The most helpful part of the book is his exposition of the biblical texts regarding elders, their position and responsibilities. Strauch made a brief but convincing case for Congregationalism in part 4, but pulled the rug out from under it. On the whole an excellent work. Whatever the reason you are looking into the topic of elders and eldership, start with this book. Excellent and comprehensive work on the subject that was a joy to read. You will leave this book with an understanding of the office and in my opinion convinced that a plurality of elders is the ideal way a church should be lead. Highly recommended! Strauch writes a well researched book on the elder led church. He uses quotes from many other authors to make his arguments. It seems somewhat negative toward a lead pastor and the practical workings of such a paradigm seems lacking. A good book on the elder led church. An excellent read for anyone in church leadership or anyone considering church leadership. It gives sound advice/ information that is biblically based. An important work, but over-hyped concerning its exegetical information. Mostly word studies with other exegetical and syntactical issues scattered throughut. But I am in agreement with the major views of this book! I read this book to have a better understanding of such a conservative view. Dr. Strauch wrote well and made his points clear and with documentation. I can't say I agree with all his views but did enjoy the read and gaining perspective. Read with care - this will mess with your ideas around church leadership. The best thing I can say about this book is that it got me to go back to the Scriptures and find a firm conviction on how we "do" church leadership. Makes a compelling case for biblical eldership. Great! Highly informative and full of great study and reference material to all interested or involved in church leadership/government. I appreciated Strauch’s goal to get rid of the CEO pastor model, but he didn’t do it well. He would contradict himself, read into scripture, ignore the Old Testament, etc. Good exegesis. I wish it had been a bit more practical. Great basic overview of just about every NT text on eldership. This was a good defense and call to Biblical Eldership; I appreciated the exegesis throughout to support his defense. An excellent resource covering the biblical basis for a plurality of elders with over half of it being exposition of the big texts on the subject. Very good. A pretty thorough introduction to elders. This is the single greatest book I have ever read on church governance. After years of reading the Bible and knowing there was something there, but not having the time nor energy to take all that truth and ask the question; how did God intend the church to be led? I have always felt uneasy with the models I have seen used throughout my life. The book is Biblical. It is well researched. It is well written. It is true. And I am thankful for it. A good book although the author is much more theologically conservative than I am. Nevertheless, he has good insight on the eldership in the Protestant church and I learned a lot. The book was actually an encouragement. One area in which I feel he hit the nail on the head was with the idea of the super pastor. "There is a dark side to the super-pastor concept...many churches are lead by highly independent, domineering, egotistical men who desperately need accountability and balance. Furthermore, A good book although the author is much more theologically conservative than I am. Nevertheless, he has good insight on the eldership in the Protestant church and I learned a lot. The book was actually an encouragement. One area in which I feel he hit the nail on the head was with the idea of the super pastor. "There is a dark side to the super-pastor concept...many churches are lead by highly independent, domineering, egotistical men who desperately need accountability and balance. Furthermore, when ruled by a superstar pastor, qualified men remain in spiritual infancy rather than growing into maturity..." (p. 22). I have seen this firsthand. Also, the author adequately describes the role of the elder. It is definitely not a job for the faint of heart as "they bear the misunderstanding and sins of others so the assembly may live in peace. They lose sleep so others may rest. They make great personal sacrifices of time and energy for the welfare of others. They face the false teachers' fierce attacks" (p. 37). However, I do disagree with him on the topic of women elders and divorced pastors. According to Strauch, five divorced pastors that took place in a panel discussion with a leading evangelical journal were not qualified by New Testament standards "to be deacons, let alone pastors (elders) of churches" (p. 167). I think that one must take into consideration the circumstances surrounding one's divorce before making the blanket assertion that they are unqualified to serve. Even if the person was at fault, does that disqualify them from ever holding a position of authority, particularly if they have repented and God has changed their life? I think not. So opposed to women in ministry leadership roles that Strauch won't even begrudgingly acknowledge leading women's roles in the scripture. Citing instead two didactic scriptures in I Corinthians as taking "precedence over incidental passages about women's activities in the general service of the Lord" (p.216). Ironically, in the next chapter, Strauch quotes a woman on the subject of ordination. But wait a minute, if women aren't qualified to lead, why is he quoting from a woman on the topic of ordination? Isn't this woman by writing this book in affect teaching even men who might pick up her book? How can you say women cannot be over men or teach them and cite from her book as an expert on a topic?